John Tebbutt, the man on the Australian $100 note, was Australia’s most famous nineteenth century astronomer and discoverer pf twp of the century’s great comets (1861 and 1881). Starting his astronomical career with an ordinary sextant and a small marine telescope, he went on tho establish single-handedly a privately run observatory which rivalled, in terms of quality and quantity of research, the much larger state-run observatories. 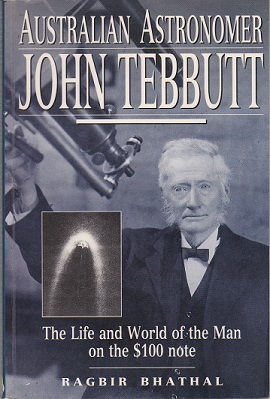 This book is the first on the life and scientific work of John Tebbutt and traces the remarkable career of this gentleman astronomer. It highlights his scientific achievements, his squabbles with other astronomers, his role in the formation of the New South Wales branch of the British Astronomical Association and his views on education, science and religion in a frontier society.